My husband claims that this recipe isn't for actual gnocchi, even though he found it tasty. I suspect that is because he is used to his mother's gnocchi which uses leftover mashed potatoes and a northern Italian marinara sauce, which is very distinctive (it contains cloves X0). However, every recipe I've stumbled upon consists of the ingredients such as I used--baked potato, eggs, flour, and some seasoning, so I'm calling it gnocchi. Specially, I followed this Michael Chiarello recipe. Since I had some sage that was on its way, I whipped up a quick sage browned butter sauce as an accompaniment. Scoop insides of potatoes and mash with a fork. Alternatively, pass through a grater or ricer. You should have about 2 cups. Mix flour, eggs, cheese, and salt and pepper as you would make pasta treating the potatoes like flour. Make a well in the middle of the potatoes for all ingredients except flour and press together with hands. Sprinkle the flour over the mixture in parts, pressing it into the potatoes as you go and until the dough holds its shape. If it is too dry, you can add a little liquid (water or egg) or flour if too wet. On a well-floured surface, cut the dough into 4 pieces. Roll each piece into a rope about 1/2-inch in diameter. Cut into 1/2-inch-long pieces. Lightly flour the gnocchi as you cut them. 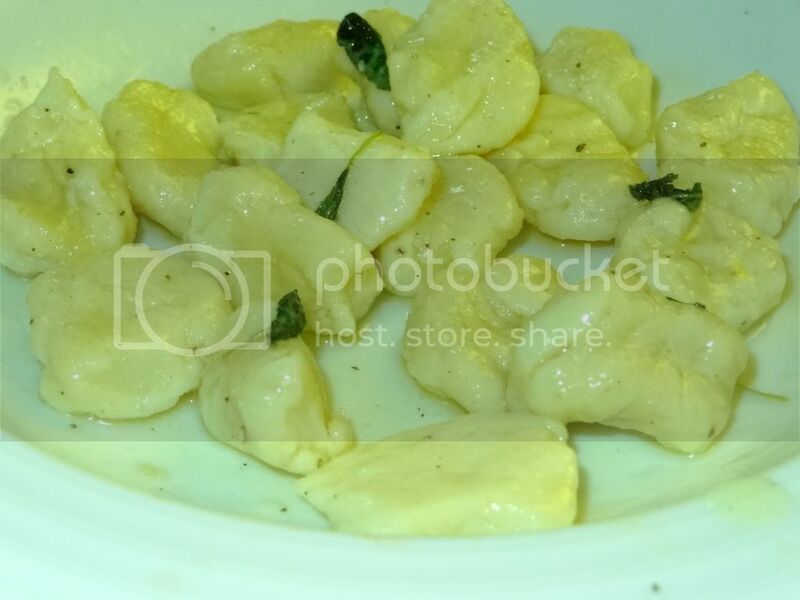 You can cook these as is or form them into the classic gnocchi shape with a gnocchi board, ridged butter paddle, or the tines of a large fork turned upside down. 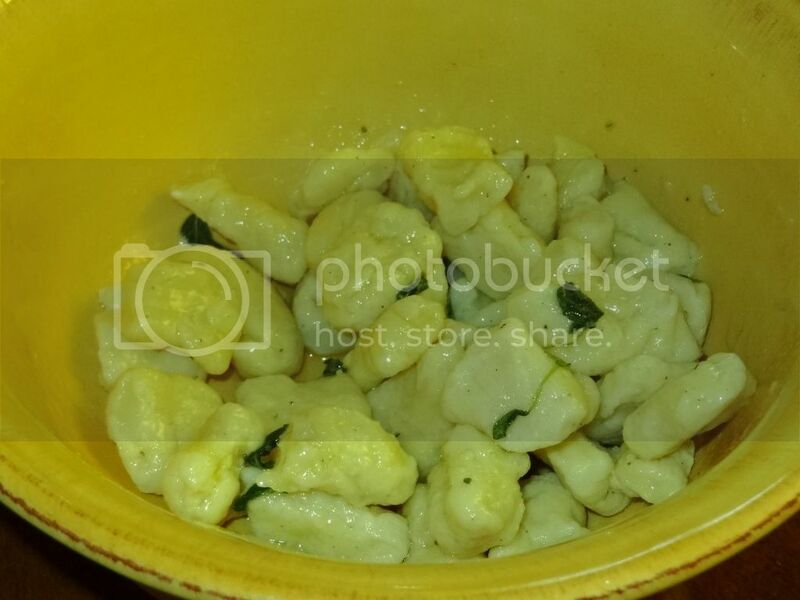 (For more instructions on how to shape the gnocchi, see the original recipe.) Allow to dry for 15 minutes before cooking. Bring a large pot of water to a boil and salt, as desired. Drop in the gnocchi and cook for about 90 seconds from the time they rise to the surface. Melt butter on medium low until it begins to brown, which is just past the melting stage. For a nice tutorial on how to brown butter go here. After the butter has melted, add the sage. Salt and pepper to taste.